Our journey to Bethlehem was almost a short one. Our driver received a call… The checkpoints are closed. 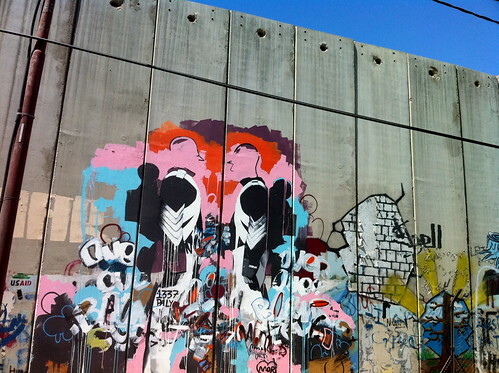 Security at Bethlehem has been increased again recently although no one could tell us why. Perhaps it’s related to the peace talks but whatever the reason getting in and out is harder at the moment. After a few calls we decided to try and cross at Herodium. We approached the checkpoint and our driver told the guard we were going to visit the old Roman Fort and we were allowed to pass. A quick U-turn just up the road and we were on the road to Bethlehem. Our hotel was right next to the Church of the Nativity in the centre of the bustling town. It was a noisy night punctuated by a very loud call to prayer at 4am from the Mosque across Manger Square. In the morning we visited the place where it all began. 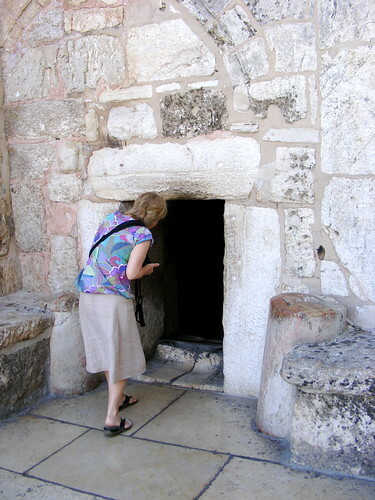 The Church of the Nativity is the oldest church in the world… with the smallest door I’ve ever seen in a church! As Leo pointed out, everyone but a child must bow their head to enter. I like that thought. The inside is vast and we explored the cave of St Jerome who first translated the Bible into Latin before waiting to go down the stairs to see the spot where Christ was born. We descended slowly and as we approached the place a phone began playing Hotel California. It seemed so appropriate, and very funny! We stifled our giggles and passed by the star on the ground and the phone rang again. Our giggles exploded and when we emerged we just couldn’t stop laughing. What was odd was the reaction of the people around us… we were told to be quiet and to move. Imagine being told to stop being happy in the place where Christ was born?!?! I couldn’t help but think that moment summed up all that is wrong with the church as an institution but that’s for another day. We then ventured to the ‘Milky Grotto’, perhaps the oddest stop on our tour. It is reported to be the place where Mary nursed the baby Jesus and is complete with a painting of Mary breastfeeding her child. Leo’s friend Jack owns a shop selling olive wood carvings just down the road from there so we visited and were warmly welcomed. In the afternoon we visited the Bethlehem International centre to drop off the books we had ‘smuggled’ for them. It’s a brilliant example of how international money can serve the local community providing health care, schools, training and work. Next, the Bethlehem Museum, a brilliant example of life in Palestine in years gone by. If you get the chance try and visit! In the evening our friends from Youth 4 Hope visited and we had a great time catching up but also hearing stories of what life behind the wall is like. In the morning we relaxed, talked and worshiped a little before heading for the Wall. The checkpoint was closed coming in to Bethlehem but thankfully open for people leaving. We were stopped and asked for passports but that was all. It was a reminder of how difficult life is for those who must negotiate the checkpoints every day. Today we headed south to the Dead Sea, the lowest place on Earth. But before the compulsory float in the sea we headed for the to of a mountain, Masada. The fortress is an amazing place with an amazing history and an even more amazing temperature. It was 45C!!! It was one of my favourite places we visited, full of echoes of the past, stunning views and remarkable architecture. 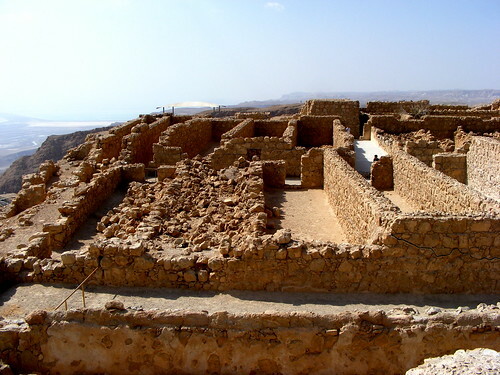 Masada was the scene of a strange battle where a small group of Judean rebels held out against the Romans for 2 years. The Romans built an earth ramp to the top of the mountain and pushed a siege engine to the top! 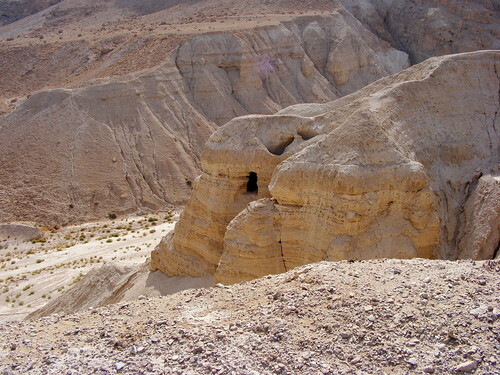 The account of the siege of Masada was related to Josephus by two women who survived the suicide by hiding inside a cistern along with five children, and repeated Eleazar ben Ya’ir‘s exhortations to his followers, prior to the mass suicide, verbatim to the Romans. Because Judaism strongly discourages suicide, Josephus reported that the defenders had drawn lots and killed each other in turn, down to the last man, who would be the only one to actually take his own life. After the scorching mountain we headed down to the Dead Sea for a float and lunch. Odd sensation. Not unpleasant, just odd. Qumran was our final destination to see where the Dead Sea Scrolls were found. By now we were just too hot. The blistering sun reflecting on the white rocks was taking its toll. The site is fascinating but we spent most of the time looking for shade! From here it was off to Bethlehem… A journey made by someone else a while ago. The night was saved by a wander down the hill to a great little pub to celebrate Sam’s birthday. In the morning we left our horrible hotel for a day around the lake at some of the significant places of Jesus’ lakeside ministry. We visited the Church of the Beatitudes where I think I managed to redeem last year’s sermon ‘choke’ on the site of the most famous sermon ever preached! Next came the church of the multiplication which commemorates the miracle of the loaves and fishes. I like this church and I love the pool in the courtyard with the carp in it! Mensa Christi, or the primacy of St Peter gave us the chance to spend some time by the shore and even have a paddle. We tried hard to walk on the top but just couldn’t manage. Our final visit of the day was to Capernaum, the home of Peter and the base of Jesus’ ministry. The village has been excavated and over the place they found a house church they have built a spaceship type church. I’ll post some pictures of it when I get home. It’s a brilliant place to visit and gives a real sense of the layout of the village and how important the Synagogue was. We stayed the night at the amazing Jericho Resort in Jericho. Our first night in Palestine was strange. The hotel is luxurious (we got a great deal!) but empty (why we got the great deal!). We had the whole place to ourselves. A well earned rest by the pool and a great meal revived our tired legs. Up early and off to Haifa to visit Elijah’s cave. I like the church with the cave in it and the dive up the coast is nice. Lunch was one of those ‘take your chances’ affairs but the falafel was pretty good. The highlight of the day was our visit to Nazareth to visit the stunning Basilica of the Annunciation which houses the home of Mary and maybe the home of Jesus through his childhood. The church is very modern, made of concrete and beautiful stained glass. I liked it the last time but was almost not allowed in. This time there were no problems. We were even able to get upstairs to see the church with it’s murals of Mary around the walls. It’s a beautiful church, well worth a visit if you get the chance. As I mentioned yesterday we were up early today for a visit to the Church of the Holy Sepulchre, the church built over the reputed site of Jesus crucifixion and burial. Jerusalem is beautiful at daybreak. It is quiet and still, bathed in golden light and the sun creeps above the tops of the buildings. We made our way through the streets, shops still closed, to the huge church which lies at the centre of the world, at least it did if you made maps centuries ago! The first time I came here I didn’t like it. Everything is covered in alters and gold and it’s just a bit much for me. But I feel drawn to it. I cant explain why but I know I’m not the only one. This time I did wait for my 2 seconds in the strange building which houses a marker which is somewhere above the tomb Jesus was laid in. And I’m glad I did. You see last night we heard from our friends Khalil and Eliane about the amazing work they do with Kids4Hope and Youth4Hope. They talked about a loving faith, a faith which they embody. For me the death of Christ is hugely significant but his resurrection is much more important. Christianity is about life triumphing over death so a tomb isn’t where that kind of faith resides for me. Later in the morning we walked part of the Via Dolorosa. The stunning church of the flagellation with it’s crown of thorn lights and stunning stained glass is beautiful but it tells a tale of how brutal we can be. We had lunch at Papa Andreus looking over the city from the roof. Now we’re going to hear about the living. Some of the young people from Youth4Hope are coming to meet with our group to talk about what life is like here for the 1.5% of the population who are Christian. It will be good to see old friends and watch new friendships be made. Today began where the last sermon left off… The Lord’s Prayer. This was my first time in the church of the paternoster where the lords prayer adorns the walls in languages from all over the world. We spotted Scottish gaelic and Doric (a dialect of Scots). My sermon the other week was about focusing on God as the Lord’s Prayer help us to do. It was an appropriate place to begin our exploration of the Holy Land. We journeyed down the Mount of Olives, with its amazing view of the old city, to Dominus Flevit. We were met at the gate by a monk, sitting under a tree with a pipe and a pint of what looked very much like beer! He reminded me of friar tuck in Robin Hood! The church commemorates the place where Jesus looked out over the city, and wept. It struck me that things haven’t changed much. A city of God which is divided equally by walls and belief. Today was Friday prayers and it’s still Ramadan so the Muslim Quarter was packed with people. The police were out in force but the rest of the city was quiet. Gethsemane next and my favourite church, the church of all nations. For the first time the connection between the lord’s prayer and Jesus’ prayer in the garden struck me. Read them together and you’ll see what I mean. Onwards to the tomb of Mary. Down lots of stairs into the dark of an Orthodox church. And the smell… Incense and candles. From there we walked around outside the city walls to avoid the crowds to the dung gate and the western wall. The wall is as close as the Jews can get to where the Temple housing the Holy of Holies and the Ark of the Covenant once stood. And that was our morning. More later but it’s time for bed. Off to the Holy Sepulchre at 6.30am. At 3am to drive to Manchester to meet the young people in our group and my colleague Leo from North Western Synod at the airport. We arrived in Jerusalem early this evening to be met by good friends. It was so good to see them and doesn’t seem like a year since we last met. Last year we came to help with a summer camp, this year is for a pilgrimage to see the Holy Sites and to meet with people to hear about life in this beautiful broken country. 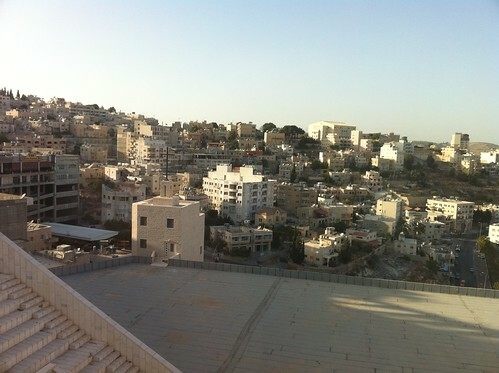 Tomorrow we are starting our day at the top of the mount of olives and working our way down the hill. Ramadan and the Sabbath collide tomorrow night so we will be steering clear of what promises to be a tense afternoon in the old city. I’m interested to see how our group experience this Holy Land. And I’m interested to see how I encounter it with more time and space to see and think and feel it. I think most of the places we’re staying have wi-fi so I’ll try to blog as we go but no doubt the detail will come next week when we’re home. Now, to sleep. It’s been a long day. And we’re sleeping in the Knight’s Palace hotel, where the knights of the crusades gathered centuries ago. I wonder what the people of those times would make of it now?